One of the nation’s longest running marathons, founded by United States Sports Academy Founding President Dr. Thomas P. Rosandich, will soon celebrate its fiftieth running in Hurley, Wisc. Wisconsin’s longest continuously running marathon, the Paavo Nurmi Marathon is set for 11 August 2018. DAPHNE, Ala. – One of the nation’s longest running marathons, founded by United States Sports Academy Founding President Dr. Thomas P. Rosandich, will soon celebrate its fiftieth running in Hurley, Wisc. 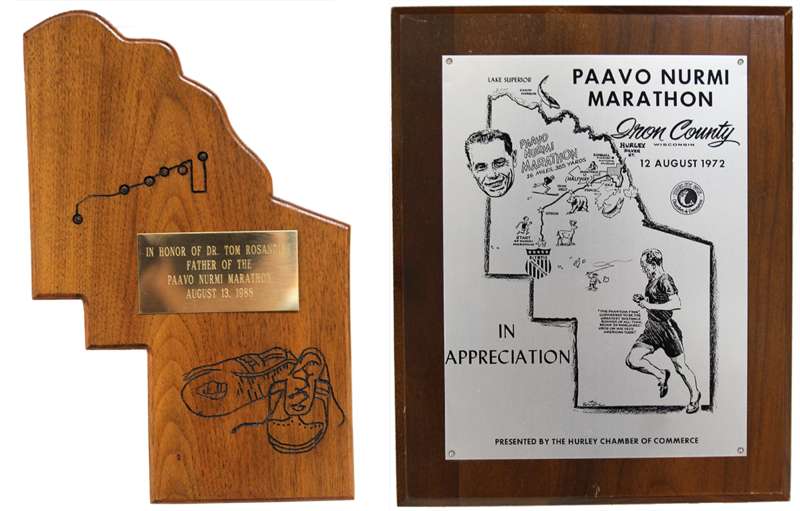 Wisconsin’s longest continuously running marathon, the Paavo Nurmi Marathon is set for 11 August 2018. The race, always held on the second Saturday of August, winds through the area’s forests, fields, rivers and lakes and features accomplished distance runners, along with novice racers and beginners. Rosandich, a native of Sheboygan Falls, Wisc., founded the race in 1969 in honor of Paavo Nurmi, who was the Finnish winner of nine Olympic gold medals in running. The name pays homage to the Finnish heritage of the Hurley area. United States Sports Academy Founding President Dr. Thomas P. Rosandich and his wife Sally Gentile Rosandich were operating the Olympia Sports Village in Upton, Wisc., when they founded Wisconsin’s longest continuously running marathon, the Paavo Nurmi Marathon, which celebrates its fiftieth run on 11 August 2018. 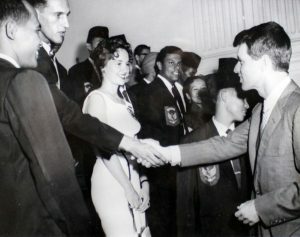 They are shown in an early 1960s photo with then U.S. Attorney General Robert F. Kennedy. This year also marks the 50th anniversary of the late U.S. senator’s assassination during the 1968 presidential race. At the time of the race’s founding, Rosandich and wife Sally Gentile Rosandich, a native of Hurley, were operating the Olympia Sport Village in nearby Upson, Wisc. A converted mining camp set deep back into the woods, Olympia was the only dedicated all-season sports camp in the nation, and athletes and teams from around the country would visit the camp to hone their skills. Rosandich thought the race would be a perfect way to help athletes achieve that objective.  “We were operating the only year-round sports training camp in America at the time,” Rosandich said. “People would come from around the world to train in skiing and cross-country skiing in the winter, and we served as a training center for cross-country runners in the warmer times of the year. Our ski trails in the winter would become running trails in the summer. “Olympia was even home to the U.S. biathlon national championship in 1968, where America’s representatives to the Olympics were selected. “We started the Paavo Nurmi Marathon and it immediately drew some of the best runners from around the world. 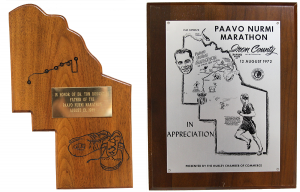 These plaques were given over the years to United States Sports Academy Founding President Dr. Thomas P. Rosandich, who founded the Paavo Nurmi Marathon in Hurley, Wisc., in 1969. 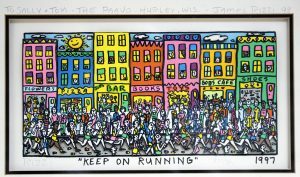 They depict the marathon route from Upson to Hurley and can be seen in the Founder’s Room in the Dr. Thomas P. Rosandich Gallery at the Academy in Daphne, Ala.
At its peak in the mid-1970s, the race – affectionately known as “The Paavo” – drew thousands of runners from around the nation. Even after half a century, it continues to draw racers of all ages and skill levels. The event is sponsored by the Hurley Area Chamber of Commerce and the Hurley Area Lioness and run by local volunteers, many of whom have embraced the race from its beginning. Rosandich has been cited numerous times over the years by people of the area for his vision in founding the race, which is on various lists as one of the longest continuously running marathons in the United States. 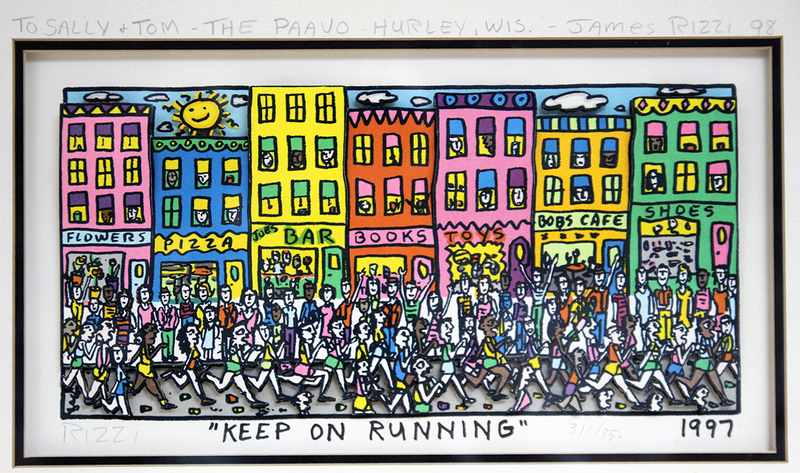 The painting “Keep on Running” by James Rizzi was given to United States Sports Academy Founding President Dr. Thomas P. Rosandich in recognition of his founding of the Paavo Nurmi Marathon in Hurley, Wisc., in 1969. The piece can be seen in the Founder’s Room in the Dr. Thomas P. Rosandich Gallery at the Academy in Daphne, Ala.
Hurley is located along the Montreal River in northern Wisconsin, just across the river from Ironwood, Mich. Runners in the full marathon start their race to the west in the nearby town of Upson, while those running the half marathon start at the 13.1-point of the full marathon, in Gile. The finish line is in downtown Hurley. For runners in the full marathon, the course is sanctioned by USA Track and Field and it is a Boston Marathon qualifying race. The men’s record for the event stands at 2:19:10, set by Richard Wilde of England in 1978. The women’s record is held by Mary Bange of La Crosse, Wisc., in a time of 2:47:49, set in 1979. For a YouTube video collage of photos from the 50 years of the marathon, go to: www.youtube.com/watch?v=601rRXDZrbo&feature=youtu.be.